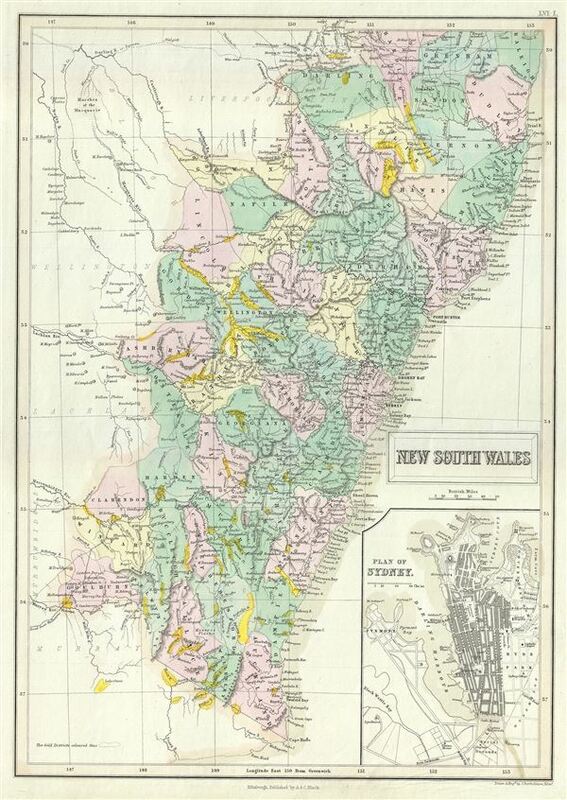 This is a fine example of the 1854 Black Map of New South Wales, Australia. It covers the settled areas of New South Wales from Raleigh to Auckland. The coastlines are accurately mapped, while the interior remains relatively unmapped. An inset in the lower right quadrant features the plan of Sydney. Important cities, towns, rivers, bays and other topographical features are noted, and elevation is rendered by hachures. The map also notes several gold districts throughout. The Australian gold rush, which started in the 1851, would attract a large number of international immigrants, tripling its population within the next 20 years. This map was engraved by J. Bartholomew and issued in as plate number LVI-I in the 1854 edition of Black's General Atlas Of The World. Rumsey 2305.067. Phillips (Atlases) 4334.